Dominic started sailing aged 6 and has never looked back, Dominic is a talented sailor regularly competing in the Plymouth and Tamar River sailing scene. Dominic left school to become an apprentice carpenter / joiner before moving onto sail-making with Westaway Sails in 2008 as a trainee Sailmaker under the guidance of Sean. Dominic quickly established himself as an accurate and diligent worker with a remarkable learning rate. In 2010 Dominic became loft floor manager leading the team of sail-makers. In 2011 Dominic left Westaway sails and joined local rivals Ullman Sails gaining valuable experience in all aspects sailmaking. Later Dominic returned to Westaway Sails to run the loft floor. 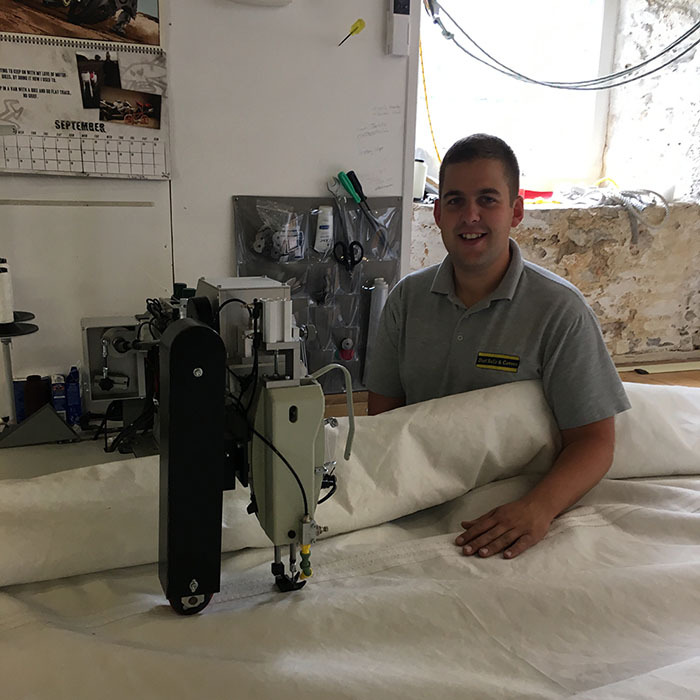 Dominic now is the main man on the loft floor ensuring high quality goes into every new sail and carrying out alterations and recuts to reinvigorate clients existing sails.